ical parts, their data access time being longer than is that of elec­tronic memories. 8. For this reason most computer systems use electronic memory for primary storage, electromechanical mem­ory being used for secondary storage. 9. Large capacity tape de­vices are used with large data processing systems, cassettes and cartridges being applied with small systems. 10. The CPU con­trols the operation of the entire system, commands being issued to other parts of the system. 7. Ознакомьтесь с терминами текста2. 8. Прочтите текст и скажите, о каких компонентах цент­рального процессора и их назначении вы узнали. Переведите текст. 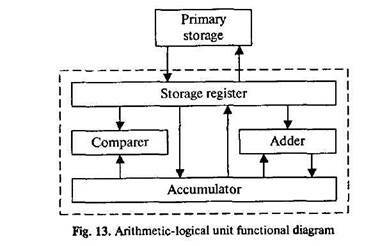 As it is known the two functional units of the CPU are the control unit (CU) and the arithmetic-logical unit (ALU). The control unit manages and coordinates the entire computer sys­tem. It obtains instructions from the program stored in main memory, interprets the instructions, and issues signals that cause other units of the system to execute them. The control unit operates by reading one instruction at a time from memory and taking the action called for by each instruc­tion. In this way it controls the flow between the main storage and the arithmetic-logical unit. The control unit has the following components: a counter that selects the instructions, one at a time, from memory; a reg­ister that temporarily holds the instructions read from memory while it is being executed; a decoder that takes the coded instruc­tion and breaks it down into individual commands necessary to carry it out; a clock, which produces marks at regular intervals. These timing marks are electronic and very rapid. age into the storage register. The instruction is passed from the storage register to the instruction register. Then the operation part of the instruction is decoded so that the proper arithmetic or logical operation can be performed. The address of the op­erand is sent from the instruction register to the address regis­ter. At last the instruction counter register provides the address register with the address of the next instruction to be executed. The arithmetic-logical unit (AL U) executes the processing op­erations called for by the instructions brought from main mem­ory by the control unit. Binary arithmetic, the logical operations and some special functions are performed by the arithmetical-logical unit. Data enter the ALU and return to main storage through the storage register. The accumulator serving as a register holds the results of processing operations. The results of arithmetic op­erations are returned to the accumulator for transfer to main storage through the storage register. The comparer performs log­ical comparisons of the contents of the storage register and the accumulator. Typically, the comparer tests for conditions such as "less than", "equal to", or "greater than". speed binary adder, which is used to carry out at least the four basic arithmetic functions (addition, subtraction, multiplication and division). The logical unit consists of electronic circuitry which compares information and makes decisions based upon the results of the comparison. 1. What are the functional units of CPU? 2. What is the func­tion of CU? 3. How does CU operate? 4. What is the function of a counter? 5. What role does a decoder play? 6. What is the sequence of CU operations? 7. What is the function of the arith­metic-logical unit? 8. What operations are performed by ALU? the function of an accumulator / comparer? Функциональные блоки; устройство управления; ариф­метико-логическое устройство; управлять работой всей системы; получать команды; основная память; посылать сигналы; считывать команды поэтапно; таким образом; временно сохранять информацию; производить пометки через равные промежутки времени; последовательность операций; регистр памяти; регистр команд; адресный ре­гистр; счетчик; датчик; дешифратор; адрес операнда; ад­ресный регистр, высокоскоростной двоичный сумматор; по крайней мере; вычитание; сложение; умножение; деле­ние; принимать решения; результаты сравнения. П. Вспомните значение новых слов и попытайтесь пере­вести словосочетания, употребляемые с этими словами. Register, address register; base register; clock register; com­mand / instruction register; counter register; CPU register; hard­ware register; input / output register; memory register; operand register; general-purpose register; special-purpose register. Counter binary counter; character counter; data counter; instruction counter; pulse counter; sequence counter; storage counter; software counter; time-out counter. Selection: color selection; directory selection; drive selection; file selection; function selection; keyboard selection; menu se­lection; security selection. Management: data management; database management; disk management; error management; information management; memory management; network management; resource manage­ment; task management; window management. Verbs: to work; to control; to receive; to keep; to send; to perform; to demand; to choose; to supply; to pass; to name; to include; to apply; to come back; to found; to explain; to form; to define; to arrange. Nouns: computer; answer; commands; memory; element; device; information; state; aim; heart; solution; computation. Adjectives: main; whole; separate; quick; correct; large; main (storage); following; every; following; specific; different; real. щие зависимый и независимый причастные обороты. ing through a conductor form an electric current. 3 Instructions being obtained, the control unit causes other units to perform the necessary operations. Instructions are ob­tained, the control unit causes other units to perform the oper­ations. Having obtained the instructions the control unit caus­es other units to perform the operations. Obtaining the instructions the control unit causes other units to perform the operations. iments with these elements being impossible. Having unknown properties the elements cannot be used for experiments. The elements having unknown'properties, experiments with them are impossible. 5. When moving in a material charged particles (заряженные частицы) produce magnetic properties (свойства) of this ma­terial. Charged particles moving in a material produce magnet­ic properties. Charged particles moving in a material, magnetic properties of this material are produced. Charged particles move in a material, magnetic properties of the material being pro­duced. 14. Прочтите внимательно текст и составьте к нему план в назывной форме. Прочтите текст еще раз, разверни­те пункты плана и составьте реферат на английском языке, озаглавьте текст. It is known that one of the fundamental parts of the com­puter is a control unit. This unit controls the computation pro­cess automatically, without man's participation. It sends signals to all other parts of the computer to specify what they must do. First of all, the control unit tells the main memory what data must be transferred to the arithmetic-logical unit and other de­vices. Then it enables the arithmetic-logical unit to perform the required operation. Finally, it places the obtained results in the main memory. It is important to note that the control unit operation is de­termined by an algorithm of a problem solution. The algorithm is a sequence of arithmetic and logical operations. These oper­ations must be performed on the initial data for solving the prob­lem. Description of an algorithm in a form acceptable by a com­puter is called a program. A program is a list of sequential com­puter instructions enabling a computer to solve a problem. In order to be acceptable by the computer instructions must be encoded into a digital form. In conclusion it should be pointed out that the main feature of a computer is automatic control of the problem solution pro­cess. It is based on the programmed-control principle. 15. Выполните письменный перевод текстов по вариантам. Озаглавьте тексты. comparatively simple computing functions at lower costs. In 1971 Intel Corporation delivered the first microproces­sor, the 4004. All the logic to implement the central processing unit of a tiny computer was put onto a single silicon chip less than 1/4 inch square. That design was soon followed by many others. The progress toward smaller computers is continuing, designers are working at nano-computers and pico-computers. When the central processing unit of a computer is imple­mented in a single, or very small number of integrated circuits, we call it a microprocessor. When a computer includes a mi­croprocessor as its major component, such device is called a microcomputer. Today the hardware in data-processing machines is built out of microelectronic devices. Advances in microelectronic devices give rise to advances in data-processing machinery. the nervous system of our society. The versatility and convenience of the microprocessor has changed the entire architecture of modern computer systems. No longer is the processing of information carried out only in the computer's central processing unit. Today there is a trend toward distributing more processing capability throughout a computer system, with various areas having small local proces­sors for handling operations in those areas. to failure. Third, the network can be small enough to be con­tained within a single laboratory or building, or it can be spread out over a wide area. 1. Вставьте необходимые слова вместо пропусков. 2. The control unit_________ instructions from the program. _____ for transferring to main storage. from primary storage into the storage register. of the storage register and the___________ .